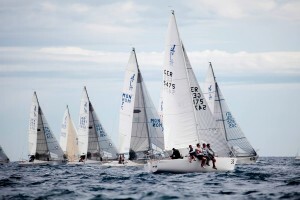 An excellent turnout with 67 boats, 11 nations and a top level playing field sums up the J24 European Championship (Open) hosted for the second time by the Yacht Club de Monaco 20 years after it organized the first edition, with the invaluable support of Stuart Jardine, a legend on the sailing scene in England and the J24 class. An international Race Committee presided by Englishman John Coveney fired the gun on eight hard-fought races over the four days, in east to south-westerly wind conditions ranging from 5 to 30 knots. It was a tactical as well as physically challenging championship for the 335 sailors, who had to cope with varied conditions, complicated by the Ligurian current, not counting practice races and a succession of starts. Faced with a compact fleet it was difficult to avoid the 67 J24s when rounding the mark or to fight for a place on the start to be sure of clean wind. With courses averaging five nautical miles and taking less than an hour, the competition was intense, with less than 10 minutes separating the first from the last in each race. The slightest error proved costly, as it did for North American champion Michael Ingham (Julia), still in with a podium finish after the second day who then found himself 17th in the overall ranking after a premature start in the eighth race. Another favourite, the Greek Dimitris Altsiadis (Evniki), winner of the Primo Cup in 2013, who with two wins clinched 5th place behind the Italian Ignacio Bonanno (La Superba). Of note was the German armada, there in force with 20 J24s but only able to get their best boat into 10th position behind the Monegasque Topo Too crewed by Blandine Medecin and the Rodelato brothers. In the end it was Englishman Ian Southworth, triple European Champion, who lifted his sixth title with Chris MacLaughlin (Il Riccio). Despite not winning a race, they were impressively consistent and always in the top six. Second place went to another favourite, triple world champion Mauricio Santacruz (Bruschetta), second in the last world championship held in Dublin in August 2013. Surprised by the level and high quality of the playing field, he won one race in style, leading from start to finish and widening the gap to put him well ahead of his competitors in the fifth race. But the title of vice-champion of Europe did not go to the Brazilian Mauricio Santacruz, but the Monegasque St Andrews, helmed by Ian Ilsley with François Brenac on tactics who pulled off a coup by coming third, just three points shy of the Brazilian. “This is the culmination of a year’s hard work. We made the trip to the World Championship in Ireland in August to prepare for this one and hone our boat. Our efforts have paid off and the contract largely fulfilled, beyond our expectations as we had set our sights on finishing in the top ten,”comments Ian Ilsley, for whom the next meeting is the Primo Cup (31 Jan/2 Feb & 7/9 Feb 2014) then the North American Championship in Mexico in March 2014. Britain’s Ian Southworth and the crew of Il Riccio, have clinched a record-breaking sixth J24 Europeans title from two former World Champions and four other past European Champions in a 67 boat fleet,in a challenging series hosted by Yacht Club de Monaco. 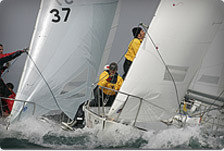 With most races sub seven knots, competitors had to adjust to the effect of wind-blown tide, shifts of 30 degrees and complete breeze shut-downs. With depths of 200-300 metres across the race area, mark positioning and start-line holding added to the challenges. The predominately light airs series presented multiple challenges both for the race crews and for the Race committee, led by Race Officer, John Coveney. Southworth ultimately took the eight race series from Santa Cruz by a comfortable 26 point margin and from second placed European, Ian Tilsley of Monaco, who brought-in former French 470 Olympian and match racer, Francois Brenac to do tactics. Ian Southworth fielded his regular crew of Andrew McLelland, David Howlett, Chris McLaughlin and Julia Scott. – who were also the 2011 European Champions. 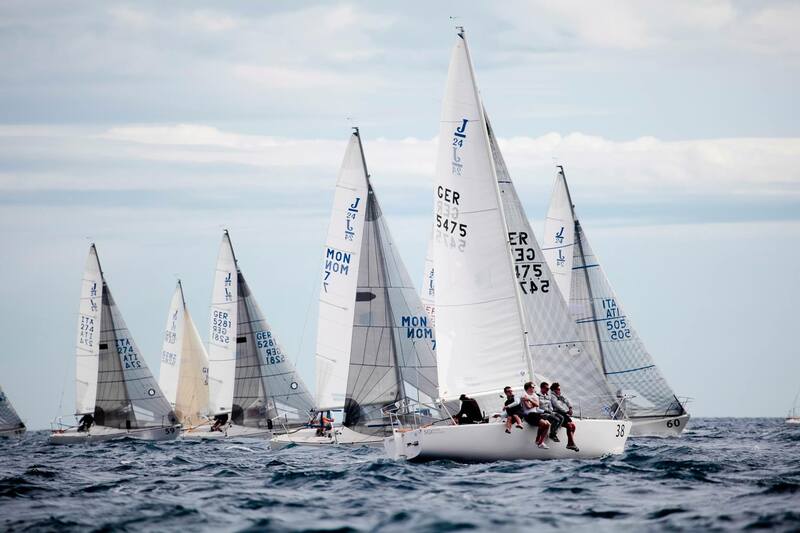 This season they have taken the UK Nationals and the Irish Nationals, then placing a frustrating 4th at the Howth World Championship after being black-flagged in a critical race start. The il Riccio team used a 1996, J Boats Italy hull, race prepared by David Heritage in Cowes and Sparloft New Zealand rig. Sails were the same as the Howth Worlds, but with a change of genoa design to test the North San Diego, Tim Healey modification. Second British boat, in 7th place, was Duncan MacCarthy in his 2003 US Watercraft boat, Madeleine, with Sparloft rig and North sails. Roger Morris and his team achieved a very creditable 14th, with three top ten finishes in his 2005 Italian-built Jolly Roger with Selden and North rig. Nick Phillips sailing Chaotic (Southworth’s former boat, Hedgehog) was less consistent but counted 2 x 3rd place and a 6th on his way to 16th place. 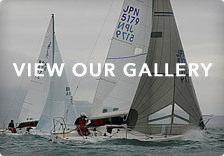 With boats changing –hands for around £10k, the J24 class is enjoying a renaissance in Europe with many new young teams. Italy and Germany each brought twenty boats o the Europeans and the German contingent included six all female teams. With the Worlds in Kiel in 2015, German sailors are really focused on rapid technical improvement. The womens’ Europeans trophy was won by Germany’s Ragna Thoennessen from Altona Yacht Club and her crew on Juelssand,from Lea-Katrina Witt and the Hamburg German crew of Alice and Francesca Guzzo and her Monaco team, sailing Cool J.